Reference number for this case: 9-oct-54-Erbray. Thank you for including this reference number in any correspondence with me regarding this case. The affair was initially published on October 13, 1954 in the form of a news release by the Agence France Presse, and was rehashed in many newspapers articles, with sometimes more information, in the following days. The witness is Gilbert Lelay, 13, a young schoolboy, described as shy person and not very imaginative, who claimed that the last Saturday, that is to say on October 9, 1954, he was riding his bike at 10:30 p.m. under moonlight. He was returning from an uncle's in Rousselière, his parents driving their car ahead of him. He arrived close to the village of Les Garrelières, when in a meadow, on his left, he saw a weird object, that he described as being similar to a ball of fire posed on the grass. He stopped. By seeing it upfront, the object was lengthy, like a "phosphorescent cigar"; when he saw it "from the side" it appeared very round. The boy crossed the meadow's barrier, and when he was within ten meters of this "ball", a "chap" came to him, put his hand on the boy's shoulder and told him: "Look at it but do not touch it!" Some sources indicate that the chap had initially put off his hat and had scraped his own head. This man spoke in French, with an accent that the boy indicated to be similar to that of "those Britton who come on our premises to sell horses." He was tall, dressed grey pants and jacket, capped a darker gray hat, and wearing boots. In a hand, he held a ball, the size of a large apple; which gave off purple reflections, or purple "fires". This man opened some sort of door in the ball-shaped object, which made it possible to the boy to see that there were two seats of red color inside, and opposite the seats, many buttons of all the colors. The man again said something that the boy could not clearly hear, then noisily slammed the door. Sheaves of fire started to all the directions, on top, bottom, the sides, and the object rose very gently in complete silence, vertically, with a "circle which turned at high speed in its lower part." when about fifty meters high, the object "turned twice in round , which is described in certain sources as "two loopings", then it "disappeared like a shooting star." The boy went up on his bicycle to go home, having difficulties to pedal and I not being able to speak, explaining that he was like paralyzed by the fear. He told his parents what he had just seen, but they called him nuts. It was the British Harold Wilkins who gave a first ufological version of the case, dating it to the beginning of November 1954, and speaking of several "entities". In the US, Gray Barker called the witness "Gilbert Lefay". 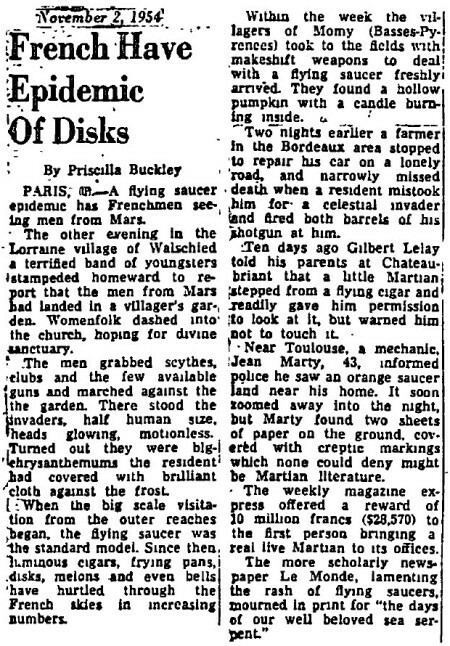 The first French ufological mention of this case is in the unpublished manuscript of Guy Quincy, a director of departmental archives who had produced a catalog of landing cases; but he gave a wrong of date of October 16, 1954, and he put it at the wrong place of Sainte-Marie-d'Herblay in Seine-et-Oise. These errors will be reproduced by Jimmy Guieu, who gives the age of 12 to the witness; then Michel Carrouges, Henri Durrant and many others. 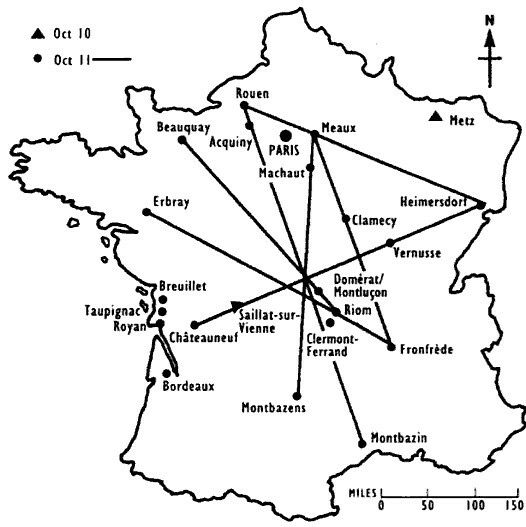 The error of location comes from the fact that it happened in the hamlet "Sainte-Marie" near the town of Erbray; Sainte-Marie in Erbray became Sainte-Marie d'Herblay, a town unrelated to the case. In 1964, Jacques Vallée included these errors in a listing, and made it follow by a correction of place, but still a wrong date; h commented that it was a hoax. But in his subsequent publications he uses again the case with the errors and no longer mentions that it was a hoax. Although some aspects of the case given by the press may suggest a description distorted by the child or by the press of the observation of a helicopter and his pilot, the case has remained largely published as geuine, or as a hoax. Paris, Oct. 13 (AFP) -- Observations of flying saucers and cigars were again reported today from certain points of France and Europe. Inquiries into previous reports were also in progress. Military authorities continue their investigation of the saucer which appeared in the beam of a searchlight installed at the Metz Fair-Exposition. The searchlight operators saw, at a distance estimated as 10 km, a luminous circle which remained immobile during several hours. However, the radar operators, who were alerted, were unable to detect anything. Military authorities are investigating the possibility that some peculiar meteorological phenomenon may have been responsible. Near the locality of Chateaubriant, in the center of France, a thirteen-year-old boy claims to have seen a machine shaped like a phosphorescent cigar only a dozen meters away. A passenger, dressed in a suit and grey hat, and wearing boots, supposedly told him "Look, but don't touch." The man is said to have got back into the flying cigar, which took off vertically. On the other hand, Anatolia [region of Turkey] had not previously had the privilege of seeing flying saucers above its territory. A report originating from Ankara [the capital] indicates that this gap is now filled. Several persons living in the Ulus quarter [suburb] of Ankara saw, about noon, an object which remained immobile above them a long time. Suddenly, it moved off at great speed, and disappeared. LOUVIERS. -- A craftsman and his apprentice claimed to have seen on the railway from Evreux to Louviers, as they drove a motorcycle, at about 3 a.m., a craft shaped like a bell, 2 m. 60 to 3 meters high, which was at one meter above the ground. The craft emitted sparks shimmering in greenish and reddish. First it rose a good 10 to 12 meters, while gushing from its base an orange glow. The lower part of the apparatus had the shape of a ring. A farm worker joined the two men to observe the phenomenon. All three state that the "bell" remained visible for about an hour. Then the orange glow became brighter, and the object rose very fast vertically, taking the direction of the east. Lisieux. -- Mr. Bon, professor of mathematics at Lisieux, saw early in the afternoon in Saint-Germain-de-Livet, 2 or 300 meters from the road, over a wooden area, a silver disc with a diameter of 7 to 8 meters, which rose suddenly in the sky, without noise. The disc was animated of a rapid movement of rotation. After diving to the ground from an altitude of about 800 meters it suddenly left horizontally at a tremendous speed. LA ROCHE-SUR-YON. -- Mrs. Drouilard, residing in La Roche-sur-Yon, said she saw in the sky Monday night around 11:30 p.m., a luminous machine resembling a mushroom, moving silently and rapidly. Nevers. -- Two residents of Clamecy (Nièvre), MM. Henry Gallois and Louis Vigneron, stallholders, stated to have seen in a meadow near Corbigny, a cylindrical craft. They say that while they were about fifty meters from the object, they felt an electrical shock, while the engine of their truck stopped and the headlights went out. When the craft was gone the headlights came on again but they had to restart the engine. LYON. -- Dr. Durand, general counsellor of the Township of Belleville-sur-Saône and Mr. Bourgeois, cafe owner in Saint-Georges de Reneins saw over the chapel of Brouilly, a flying saucer. On the other hand, around 7:30 p.m. Monday night, MM. Dubois, rugby player and Coulon, swimming champion, saw, flying at low altitude, in the direction of Montgelas, a ball of fire that changed color several times. TOULOUSE. -- Two residents in the Toulouse suburb, Mr. Pierre Vidal and his nephew Angel Hurle, saw yesterday morning at dawn, a hundred meters from their house, a giant rocket, fly away from a field and disappearing into the sky while producing a clarity of rare intensity. The two men then went to the place where they thought the starting point of the mysterious craft was located. There, they found that the grass had been trampled on a circular area with a diameter of 6 meters. In the center of the area they found in the ground, four prints appearing to have been left by the feet of a heavy machine. The grass was covered with droplets of fat steam condensation and smelled of oil. The police went to the scene. CHATEAUBRIANT. -- A 13-year-old boy, young Gilbert Lelay, said he saw on Tuesday night around 10:30 p.m., a mysterious craft in a field some 600 meters from his parents' home in the village of Sainte-Marie en Erbray near Chateaubriant. The child claims to have spent ten minutes looking at ten meters this craft that was shaped like a phosphorescent cigar. A passenger, a man wearing a suit and a gray hat, wearing boots, reportedly told him in French, "Look but do not touch." He put the hand on his shoulder, while with the other he held a ball launching purple lights. He climbed into the craft through a door that slammed. On what could have been a dashboard, there were several colored buttons. Still according to the child, the machine rose slowly vertically, throwing light in all directions, flew two rounds in the air and suddenly disappeared. VIENNA. -- Harald Kreutzberg, the Austrian Serge Lifar, living in Seefeld in Tirol, observed while he was in his garden, a flying saucer that flew over the small town for a few seconds before heading north and disappearing behind mountains. Several residents of Seefeld also observed the phenomenon and tried unsuccessfully to photograph the mysterious craft. Chateaubriant, October 13. -- A 13-year-old young boy, little Gilbert Lelay, laims to have seen, yesterday evening towards 10 p.m., a mysterious craft in a meadow, at some 600 m of his parents' home, at the village of Ste Marie-en-Erblay, close to Chateaubriant. The child states to have stayed ten minutes watching, at ten meters, this craft which had the shape of a phosphorescent cigar. A passenger, a man dressed of a suit and a gray hat, fitted with boots, reportedly told him in French: "look at it, but do not touch!". He put his hand on the child's shoulder, while the other hand held a ball launching purple fires. He went up in the apparatus by a door which he shut noisily. On what could be a dashboard were several multicoloured buttons. Still according to the child, the craft rose slowly vertically, throwing fires of all the directions, made two turns in the airs and disappeared suddenly. Throughout the Metz fair, a military projector is installed at the Army's exhibit, sweeping each evening the sky of Metz with its beam of light. Sunday evening, the users of the device saw, at a height estimated at more than 10 000 m, a luminous circle which remained motionless above their heads during several hours. The radar service, also set up at the army's exhibit, vainly tried to catch the strange circle in its device. A local journalist having reported the facts, the General governor, in command of the 6th military area, ordered an investigation, which, until now, did not succeed. General Navereva awaits the report by commander Cottel, person in charge of the army exhibit. According to the first information collected as of yesterday, it seems impossible that the projector set up at the Metz fair of Metz could catch an unspecified object placed so high. Indeed, this headlight hardly has a range of 5000 meters, distances which in very clear weather would perhaps make it possible to distinguish something. The luminous circle caught in the projector beam could be explained by the presence, at a great height, of an illuminated cumulus lit by the moon, full at that time, and hidden behind a curtain of clouds. One remains skeptikal meanwhile, waiting on the presence of a round object which would have had, one estimated, fifty meters diameter and which would be remained perfectly motionless during several hours. However, the military services continue their investigations and will draw the conclusions of this case as soon as they will be in possession of the report by commander Cottel. "LOOK BUT DO NOT TOUCH!" ERBRAY (from our special envoy: P. DOUCET). Without pretending to play smart, we were skeptical. Extremely skeptical. The hero of the affair, the "seer" was a teenager, he was still at this age when innocence is the most splendid aureole of which the most beautiful legend shine, he was a child from on our own premises, a pupil of the primary school, a modest and estimated circle. Then, addition of interest, our small visionary doubled as a pleasant and deferent listener. Not only he "had seen" the mysterious craft, not only he had contemplated it all at ease, but also, the strange pilot had spoken to him, and in French and using the plural person, as appropriate between educated people. Either the child was victim of his imagination and a mirage, or he wanted to impress his young comrades, or even he dealt with a smiling hoaxer. The picture would also not lack of a certain romantic touch: this ball of fire in a green meadow, under the moonlight. That sums up rather well the flood of thoughts which occupied us during this short trip which led us to the public school of Erbray, where we were ensured to meet the young pupil of the course of the Certificate of Studies: Lelay Gilbert, 13 years old. We were well decided to put a term at this nonsense, to confuse the young joker or at least to make him hear that he had been the victim of a very well organized prank. This means that we felt well armored, that with us at least, no tall tale would be believed! How is it done, then? How is it done that we are left completely dumbfounded here, vis-à-vis this little boy who tells us what he saw and... heard, vis-à-vis this shy child, almost apprehensive, who continuously lowers the head, who is known for his very average intelligence, for his rather restricted imagination, and who does not read the newspapers or barely, and never went to the movies? The fact is, you see, under it most simplistic aspect a priori, this "story " that the child tells us has more than one disconcerting side, by its qualities, the general behavior of the storyteller, and by some of his declarations. "A "MAN" PUT HIS HAND ON MY SHOULDER"
- It was Saturday evening, he said. It was 10:30 p.m.. There was moonlight. I was on bicycle. I was returning from an uncle's, in Rousselière. My parents were in front in the 4CV [car]. I arrived close to the village of Garrelières, when in a meadow, on my left, I saw an odd object. - Describe that object for us? - It was as a ball of fire posed on the grass. When I stopped and when I saw it upfront, it was all in length; then, from the side I saw it as very round. I crossed the fence of the meadow and I was within ten meters of the "ball" when a "man" came to me, put his hand on my shoulder and tells me: "Look at it but do not touch!" - and this "man", how was he? - Tall, gray jacket and trousers, hat gray also but darker. He held in a hand a ball, large like a large apple, launching purple reflections. He had boots. - So, he talked to you in French? - Yes, very fast and with a strong accent! - What kind of accent? - That of the Britons who comes on our premises to sell horses! - He didn't say anything else? - And how did he leave? - He opened a kind of door which he then closed again with noise. - Did you see the interior of the craft? - Yes, there were two seats of red color and opposite them many buttons of all colors. - Then the craft flew away? - Sheaves of fire started from all the directions, at the top, at the bottom, on the sides. "It" rose up very gently in complete silence and vertically. Arrived at about fifty meters, it turned twice in circles then it disappeared like a "shooting star." - And you not noticed no other particularities? - I did, while it rose, a circle turned at full speed in its lower part! - Then you returned home? - Yes, but I had difficulty to pedal and I could not speak any more. I was like paralyzed by the fear. - You told your parents what you had just seen? - They called me ... crazy! What more is there to say? What comments? During this entire interview, we warned the child against any attempt at trickery on his part, preventing him about the range, the seriousness of his testimony. Metz, October 13. -- Throughout the fair of Metz, a military projector, installed at the army axhibit, swept, each evening, the sky of Metz with its beam of light. Sunday evening, the servants of the device saw, at a height estimated at more than 10.000 meters, a luminous circle which remained motionless above their head during several hours. The radar service, also set up at the army exhibit, vainly tried to catch the strange circle in their device. A local newspaper having reported the facts, the General governor commanding the 6th military area ordered an investigation which, until now, did not conclude. General Navereau awaits the report by Major Cottel, person in charge of the Army exhibit. According to the first information collected as of yesterday, it seems impossible that the projector set up at the fair of Metz could catch any object put so high. Indeed, this projector hardly has a 5.000 meters range, a distances at which, in very clear weather, it could perhaps make it possible to distinguish something. The luminous circle caught in the projector's beam could be explained by the presence, at a great altitude, of a whirling cumulus lit by the moon, full, and hidden at this time behind a curtain of clouds. One remains skeptical, in expectation, on the presence of a round object, which would have had, one estimated, fifty meters in diameter, and which would have remained perfectly motionless during several hours. However the military services continue their investigations and will draw the conclusions from this case as soon as they are in possession of the report by Major Cottel. Chateaubriant, Oct. 13. -- A 13 year old little boy, young Gilbert Lelay, claims to have seen yesterday evening, at about 10:30 p.m., a mysterious machine in a meadow, at a few 600 meters of the residence of his parents, at the village of Sainte-Marie-en-Erbray, close to Chateaubriant. The child states he stayed ten minutes to observe, within ten meters, this machine which had the shape of a phosphorescent cigar. A passenger, a man dressed of a suit and a gray hat, fitted with boots, reportedly told him in French: "Look, but do not touch." He put a hand on the boy's shoulder while, with the other hand, he held a ball throwing purple fires. He climbed in the apparatus thtough a door which he slammed. On what could be a dashboard, were several multicoloured buttons. Still according to the child, the machine rose slowly vertically, throwing fires in all the directions, made two turns in the airs and disappeared suddenly. Vienna, Oct. 13. -- Mr. Harald Kreutzberg, the Austrian Serge Lifar, Seefeld resident, in the Tyrol, observed as he was in his garden, a flying saucer who flew over the small city during a few seconds before moving towards the north and disappear behind the mountains. Some residents of Seefeld also observed the phenomenon and vainly tried to photograph the mysterious craft. "Look, but do not touch"! Paris. -- A "Martian" finally spoke in loud and intelligible voice! Gilbert Lelay, a 13-year-old kid, was the happy listener. Whatever one thinks of his story given to the gendarmes. "I live in Sainte-Marie-en-Erbray (Loire-Inférieure). Monday evening at about 10:30 p.p., I was out of my parents' home when, in a nearby meadow, I saw a phosphorescent craft that had the shape of a cigar. I observed it for ten minutes". "All of a sudden, a man came down from it, he was wearing a suit and a grey hat and had boots on: he told me in French: "Look but do not touch". He put a hand on my shoulder while in the other hand, he was holding a ball. Then he climbed into the craft, there were several multicolored buttons like on the instrument panel of a plane. LELAY: "He told me "Look, but don't touch"
It looked like a cigar, and it shone like a glowworm shining in the grass at night, said little Gilbert Lelay, mimicking the length of the craft seen by him in a meadow. "I was ten meters from the thing and I did not dare to approach, but there was a man of average size next to it. He was dressed in gray. He had boots on the feet. He seemed sweet. he approached me. He took off his hat, he scratched my forehead, he put his hand on my shoulder and said very kindly, "Look but do not touch." In the other hand he had a ball which launched purple fires. Then he entered his craft, laughing, and it flew away. Paris (UP) -- A flying saucer epidemic has Frenchmen seeing men from Mars. The other evening in the Lorraine village of Walscheid a terrified band of youngsters stampeded homeward to report that the men from Mars had landed in a villager's garden. Womenfolk dashed into the village church, hoping for Divine sanctuary. The men grabbed scythes, clubs, and the few available guns and marched against the Martians. They marched to the garden. There stood the invaders, half human size, heads glowing motionless. Turned out they were big-blossomed chrysanthemums the resident had covered with brilliant cloth against the frost. When the big scale visitation from the outer reaches began, the flying saucer was the standard model. Since then luminous cigars, frying pans, discs, melone and even bells have hurtled through the French skies in increasing numbers. Within the week the villagers of Momy (Basses-Pyrenees) took to the fields with makeshift weapons to deal with a flying saucer freshly arrived. They found a hollow pumpkin with a candle burning inside. Two nights earlier a farmer in the Bordeaux area stopped to repair his car on a lonely road, and narrowly missed death when a resident mistook him for a celestial invader and fired both barrels of his shotgun at him. Ten days ago Gilbert Lelay told his parents at Chateaubriant that a little Martian stepped from a flying cigar and readily gave him permission to look at it, but warned him not to touch it. Near Toulouse, a mechanic, Jean Marty, 43, informed police he saw an orange saucer land near his home. It soon zoomed away into the night, but Marty found two sheets of paper on the ground, covered with cryptic markings which none could deny might be Martian literature. The weekly magazine Express offered a reward of 10,000,000 Francs ($28.570) to the first person bringing a real live Martian to its office. The more scholarly newspaper Le Monde, lamenting on the rash of flying saucers, mourned in print for "the days of our well beloved sea serpent." The author indicates that in the beginning of November 1954, an encounters with saucer entities was reported by Gilbert Lefay, aged 13, of Chateaubriant. He was told in French that he could look at but not touch the saucer, a large ball that radiated purple light. Thirteen-year-old Gilbert Lefay [sic] of Chateaubriant saw a saucerman with gray suit and hat, wearing boots and holding some sort of ball which gave out purple light. This saucerian, who had landed in a field, spoke perfect French to the boy. The boy was evidently curious about the thing in the spaceman's hand, for it was reported the saucerian said, "You can look at it, but do not touch!". "It resembled a cigar, and it shone ike a glow-worm in the middle of the night the child. I was within ten meters of the thing and I did not dare to approach, but there was a man of average size at its side. He was dressed in gray. He had boots at the feet. He seemed a nice person. He approached me. He removed his hat; he scraped his face, put his hand on my shoulder and said to me gently: 'Looks at it, but do not touch it!' In the other hand, he had a ball which launched purple fires. Then, he went up in his apparatus while laughing and it flew away." Jimmy Guieu notes that the somehow naive testimony may seem suspicious, but the detail of the ball which launches purple fires appears in his opinion hardly "inventable" for a 12 year-old child, and since "various witnesses state" that flying saucers occupants hold in their hand a sort of lamp, sometimes fixed at the belt or on the chest; Jimmy Guieu finds it hard to believe that the child was informed of this detail. Guieu indicates that the only thing that "shocks the 'reasonalble' mind" is that the occupant spoke in the French language. But he explains that they could have learn the language by picking up our radio broadcasts and by reading our books, magazines etc. with special "televisionners" that he also calls "teleprojections," or by using telepathy. He indicates that there is intent for him to completely admitting the last assertions of George Adamski in its new book "Inside the Space Ships" but he finds it not impossible that these beings can understand us and the possibility that there are aliens among us who resemble us and study and contact us is a "very plausible possibility." Michel Carrouges indicates that on October 12, 1954, in Saint-Marie-d'Herblay in the Loire-Atlantique, the young Lelay, aged 13, is alone 600 meters away of the house of his parents. It is there that during 10 minutes, he looks at a machine in the shape of a "phosphorerescent cigar" which is a meadow. Carrouges indicates that in the Agence France Press (AFP) newsbrief for October 13 relating to this incident, the witness is within 10 meters of the machine. The account says that that the pilot of this machine put the hand familiarly on the shoulder of the witness, and said to him "looks at it, but do not touch it." Carrouges notes that the description of the pilot, who is a man, is rather reassuring: he wears a gray hat, a suit and boots. The only strange detail, notes Carrouges, is that he holds "a ball launching of purple fires" in a hand. At the end of the ten minutes, of which Carrouges wonders what they were used for, the pilot goes up on board and "maks the door bang." The witness had the time to look inside the machine: there was "a kind of dashboard with multicoloured buttons." The machine rose slowly, launched light in all the directions, made two turns in the airs and "disappears suddenly." Carrouges notes that the witness could see the machine closely during ten minutes, but that it is not known whether he looked at it well. In particular, "there is no indication denying or confirming the presence of rotor blades; there is none either about the noise." By checking against original sources we have also found a mistake in the G. Quincy catalogue; the sighting at Ste Marie d^Herblay (October 16, 1954) should be diregarded, the child named Gilbert Lelay is the witness of October 12 case at Erbray, and the story is definitely another hoax. The author indicates that on October 12, 1954, at approximately 10:30 p.m., in Sainte-Marie d'Herblay, on the Atlantic coast in France, Gilbert Lelay, aged 13 years, walked at 800 meters of his parents' house when he saw an apparatus in an enclosure that he described as resembling a phosphorescent cigar. A man in a grey suit, boots and a gray hat stood near the object. The man familiarly put the hand on Gilbert's shoulder and told him in French: "Look, but do not touch." The man held in the other hand a ball emitting of the crimson rays. He climbed in the apparatus little after and locked himself up there by slamming the door, but Gilbert had the time to see a kind of dashboard with many lights of color. The apparatus rose with vertically, made two loops while sending light in all the directions, then disappeared. Oct. 12, 1954, 10:30 P.M., Sainte-Marie d'Herblay (France). Gilbert Lelay, 13, saw a phosphorescent cigar in a pasture and a man near it, wearing a gray suit, boots, and a gray hat. He held a flashing sphere and told Gilbert in French not to touch it. He went back inside the craft, which flew in loops and vanished. "It resembled a cigar and it shone like glow-worms in middle of the night; I was then within ten meters of this thing but I did not dare to approach it. There was a man at its very side, of average height, dressed in grey. He wore boots. He seemed gentle and approached me. He carried a ball which launched small purple flashes in the hand. He took off his hat and scraped his forefront, then he put the other hand on my shoulder and said to me nicely: "looks at it, but don't touch it." Then, while laughing, he enetered his craft again it flew away." Henri Durrant comments on the case by indicating that it is not likely that a 12 year old child invents the detail of the hand held ball launching sparks, but that the case is perhaps not documented enough nor convincing. He notes that the occupant of the machine speaks in French, acts with great calm and in a gentle and friendly way. The authors indicate that in the area of Chateaubriant, the young Gilbert Lelay encountered a character wearing a jacket, boots, a hat, and speaking French. They indicate that they found the witness and wrote to him twice and tried to reach him phone on several times, but "no answer, nothing positive" and that from the nature of what it had described, the idea that he would have really seen this did not even come to their minds, and that his behavior at the time of their investigation attempt consolidated this opinion. They all the same salute in him the inventor of the "Martian" in suit and hat, "French elegance obliges". The two authors indicate that in Erbray in the Loire-Atlantique, on October 12, 1954 at 10:30 p.m., a 13-year-old boy, Gilbert Lelay, observed within 600 meters of his residence a phosphorescent machine in the shape of cigar posed in a meadow. The object was within ten meters of him. Close to the apparatus was a man dressed of of a suit, a gray hat and boots. He approached the child, removed his hat, scraped his forehead, put his hand on the shoulder of the child and told him: "Look at it, but do not touch it". In the other hand he had a ball launching purple fires. The man went up in his machine laughing. The machine took off vertically while launching fires in all the directions, it made two turns in the air and disappeared suddenly. The sources are noted as case 245 of the Vallée catalogue; Michel Carrouges in "Les Apparitions de Martiens" page 103; Jimmy Guieu in "Black-Out sur les S.V." page 233; La Croix for October 14, 1954; Quincy. PARIS, (UP). -- A flying saucer epidemic has Frenchmen seeing men from Mars. The other evening in the Lorraine village of Walscheid a terrified band of youngsters stampeded homeward to report that the men from Mars had landed in a villager's garden. Womenfolk dashed into the church, hoping for divine sanctuary. The men grabbed scythes, clubs, and the few available guns and marched against the garden. There stood the invaders, half human size, heads glowing motionless. Turned out they were big chrysanthemums the resident had covered with brilliant cloth against the frost. When the big scale visitation from the outer reaches began, the flying saucer was the model. Since then, luminous cigars, frying pans, disks, melons and even bells have hurtled through the French skies in increasing numbers. Within the week the villagers of Momy (Basses-Pyrenees) took to the fled with makeshift weapons to deal with a flying saucer freshly arrived. They found a hollow pumpkin with a candle burning inside. Near Toulouse, a mechanic, Jean Marty, 43, informed police he saw an orange saucer land near his home. It soon zoomed away into the night, but Marty found two sheets of paper on the ground, covered with cryptic markings which none could deny could be Martian literature. The weekly magazine express [L'Express] offered a reward of 10 million francs ($28.570) to the first person bringing a real live Martian to its offices. The more scholarly newspaper Le monde, lamenting the rash of flying saucers, mourned in print for "the days of our well beloved sea serpent." In the Atlantic seacoast town of Sainte-Marie d'Herblay there lived thirteen-year-old Gilbert Lelay, a lad with considerable imagination. On the 12th of October this youth told authorities he had come across an odd machine- resting in a pasture, a sort of "phosphorescent cigar," and next to it was a man who came up to Gilbert and said (in French it is assumed) it was permitted to observe but not to touch anything. The man did not stay long, but before he left in the machine, Gilbert noticed that in the man's hand was a glowing sphere that sent out shafts of purple light. As the door on the cigar-shaped machine opened and closed, Gilbert got a glimpse, he said, of a console covered with colored lights. When the odd craft vaulted into the sky, it performed two loops. 113. After inquiries were made, Gilbert's claim was determined to be bogus, but that did not discourage the boy who was associated with another false report on the 16th at Erbray. 114. 113. Vallee, Jacques. Passport to Magonia. p.147. 114. Vallee, Jacques. "Letter to the editor." Flying Saucer Review. May-June 1964. Vol.10,No.3. p.22. The authors indicate that on October 12, 1954, in Sainte-Marie d'Herblay, France, at 10:30 p.m., Gilbert Lelay was walking, and saw a "phosphorescent cigar" in a pasture and a man in a gray suit, boots, and gray hat nearby, holding a flashing sphere emitting purple rays in his other hand. The man put his hand on Lelay's shoulder and said in French: "Look, but don't touch." He then reentered the craft, which had colored lights and what appeared to be a control console. The door shut, the object rose up, made two loops, and flew off while radiating light. The authors indicate that the source is Jacques Vallee, Passport to Magonia, Chicago, Henry Regnery, 1969, page 147. "It resembled a cigar, and it shone like a glow-worm in middle of the night. I was within ten meters and I did not dare to approach. There was a man very near, dressed in gray. He had boots at the feet. He had a gentle look and approached me. In a hand he carried a ball which launched small purple flashes. He removed his hat and scraped his face, he put the other hand on my shoulder and told me nicely: "Looks at it, but do not touch it". Then, while laughing, he went up in the apparatus and flew away." She indicates that the sources are Henry Durrant in "Premières enquêtes sur les Humanoïdes ET", Laffont, 1977, page 53,54 who gives the date as October 16; Vallée in "Chronique des apparitions ET", Denoel, 1972, page 278, who give the date of October 12, and M. Figuet / J.L. Ruchon in "Ovni, premier dossier complet...", Alain Lefeuvre publisher, 1979, page 157. 13-year old Gilbert Lelay was walking around outside, about half a mile away from his parent's home when he saw, in a pasture, a machine he described as a "phosphorescent cigar." Close to the object was a man wearing a gray suit, boots and a gray hat. In a familiar gesture, the man put his hand on Gilbert's shoulder and told him in French: "Look but don't touch." In his other hand, the man held a sphere from which purple rays were emitted. Shortly thereafter, he climbed aboard the craft and shut the door with a clapping sound. Gilbert had time to something like a control console with numerous colored lights on it. The craft arose vertically, made a couple of loops while throwing light in all directions, and vanished. Jérôme Beau indicates that on October 12, 1954, at 10:30 p.m., Gilbert Lelay, 13, saw a phosphorescent cigar in a pasture and a man near it, wearing a gray suit, boots, and a gray hat. He held a flashing sphere and told Gilbert in French not to touch it. He went back inside the craft, which flew in loops and vanished. Jérôme Beau indicates that the soruce is "Carrouges, M. 103"
Luc Chastan indicates that in the Loire Atlantique in Erbray on October 12, 1954 at 22:30, "A child observes within 600 meters of his home a phosphorescent machine in the shape of a cigar posed in a meadow. The object is within ten meters of the witness. Close to the apparatus is a man dressed in a suit, a gray hat and boots. He approaches the child, removes his hat, scrapes the face, puts the hand on the shoulder of the child and tells him "look at it, but do not touch". In the other hand he had a ball launching purple fires. The man goes up in his machine while laughing. The latter takes off vertically, launching fires in all the directions, makes two turns in the airs and disappears suddenly." The source is noted "Ovni, Premier dossier complet... by Figuet M./ Ruchon J.L. ** Alain Lefeuvre pub. 1979". The website indicates that on 11 October 1954 in daytime there was a sighting in Erbray, France. "An object was sighted that had an appearance and performance beyond the capability of known earthly aircraft. An unidentifiable object was observed at close range." The website indicates that on 16 October 1954 at 21:30 in Ste Marie D'Herblay, France, "Unintelligible language", and "Close encounter with a an unidentified craft and humanoid occupants. One object was observed by one male 12-year-old witness at an airport (Lelay)." The sources are noted Guieu, Jimmy, Flying Saucers Come from Another World, Citadel, New York, 1956; Vallee, Jacques, Computerized Catalog (N = 3073); Vallee, Jacques, Challenge to Science: The UFO Enigma, Henry Regnery, Chicago, 1966; Vallee, Jacques, Preliminary Catalog (N = 500), (in JVallee01). Gilbert Lelay (13) was out walking near the Ste Marie Farm, about 800m from his house when he encountered a phosphorescent cigar shaped object in a pasture. Standing close to this object was a man in a grey suit, boots and hat. The man put his hand on Gilbert’s shoulder and said “Look but don’t touch”. In his other hand the stranger held a sphere, which emitted purple rays. Shortly afterwards he climbed on board the object, shutting a door with a clapping sound, but not before Gilbert had time to see something like a control panel with numerous flashing lights. The object rose vertically, made a couple of loops, casting light in all directions then vanished. Vallee 1969, p.147 and Case 254 citing Carrouges 1964 p 103. 13-year old Gilbert Lelay was walking around outside, about half a mile away from his parent’s home when he saw, in a pasture, a machine he described as a “phosphorescent cigar.” Close to the object was a man wearing a gray suit, boots and a gray hat. In a familiar gesture, the man put his hand on Gilbert’s shoulder and told him in French: “Look but don’t touch.” In his other hand, the man held a sphere from which purple rays were emitted. Shortly thereafter, he climbed aboard the craft and shut the door with a clapping sound. Gilbert had time to something like a control console with numerous colored lights on it. The craft arose vertically, made a couple of loops while throwing light in all directions, and vanished. 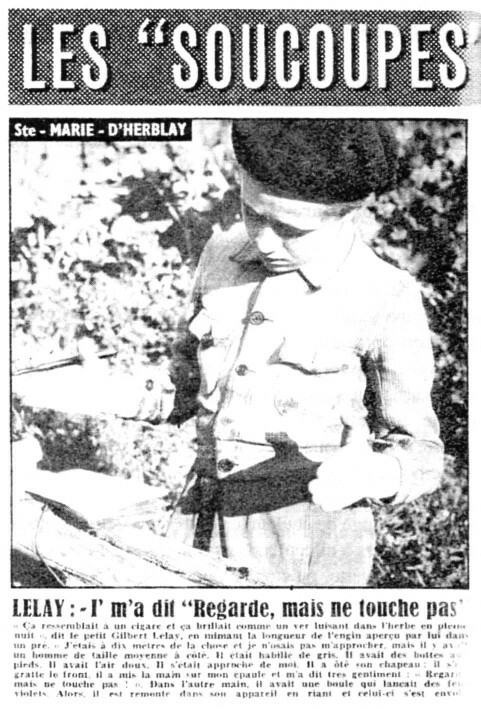 *Oct. 12, 1954 - Ste.-Marie d'Herblay, France. At 10:30 p.m. Gilbert Lelay, age 13, saw a phosphorescent cigar-shaped UFO in a pasture and a man standing near it, wearing a gray suit, boots, and a gray hat. He held a flashing sphere and told Gilbert in French not to touch it. He went back inside the craft, which flew in loops and then vanished. (Sources: Michel Carrouges, Les Apparitions de Martiens, p. 103; Jacques Vallee, Passport to Magonia: A Century of Landings, p. 226, case # 245). The whole story took place in the town of Sainte-Marie d'Herblay, located in the department of Val d'Oise, near Paris. Gilbert Lelay, the only witness of this scene, sees just a few meters away a flying machine, which was unlike anything known, land. From this spaceship, a humanoid, resembling a priori the erthmen, came down. The young man, stunned, could not understand the reason for this intergalactic visit.
" It looked like a cigar, and it shone like a glowworm shines at night; I was then about ten meters from this thing but I did not dare go near. There was a man very close to it, of average size, dressed in gray. He had boots on the feet. He was gentle and approached me. He carried in one hand a ball which launched small purple lightning. He took off his hat and scratched his forehead, then he put his other hand on my shoulder and said gently, 'Look but do not touch.' Then while laughing, he got back into his craft and it flew away. " Quincy and Durrant locate the case on October 16, the other sources locate the case on October 12. I bet that "16" came from a confusion with "16" as the timing in French for "04:00 p.m.". The case cannot be on the 16th since it was reported by AFP on the 13th. The only trace of a correct date is given by the young witness himself in the Ouest-France newspaper: the boy said it was Saturday, so the case was on Saturday, October 9. The majority of the authors indicate the event's time as 10:00 P.M., others at 04:00 P.M. I did bet that a 12 year old child has few chances to be outside at 10:00 P.M., and that the correct time is perhaps 04:00 P.M., but that is also dubious. Thereafter, when I obtaining the article of the newspaper Ouest-France, the mystery was solved: the boy returned from an uncle's while following by bicycle the car of his parents. The late hour thus does not have anything incongruous anymore. All the sources give the place as being Sainte-Marie d'Herblay in the Val d'Oise, except Figuet and Ruchon which seem according to a short summary of their case file to locate it as being Erbray close to Chateaubriant in the Loire Atlantique. And indeed, "Erbray close to Chateaubriant in the Loire Atlantique" exists, while there is no Sainte-Marie d'Herblay in Val d'Oise. There is a Herblay village there, and schools or churches named Sainte-Marie abund, but it does not seem that there is any village or city strictly named Sainte-Marie d'Herblay there. I thus made the bet that the real place is the one indicated by Figuet and Ruchon. Obviously, Durrant was right when he wrote that the case might have been poorly documented. Hoax, child tall-tale, or helicopter. [af1] AFP (Agence France Presse) Press Release, October 13, 1954. [ad1] Article in the regional newspaper L'Ardennais, Charleville-Mézières, France, October 14, 1954. [la1] Article in the regional newspaper L'Alsace, Mulhouse, France, October 14, 1954. 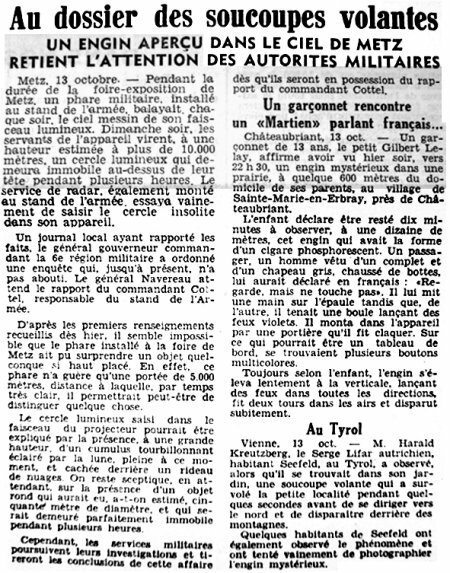 [vm1] Article in the regional newspaper Var-Matin - République, Toulon, France, October 14, 1954. [er1] Article in the regional newspaper L'Est Républicain, France, page 8, October 14, 1954. [---] Article in the national newspaper La Croix, Paris, France, October 14, 1954. [ra1] Insert in Radar magazine, Paris, France, October 24, 1954. [sp1] Article in the foreign newspaper The Star Press, Muncie, Indiana, USA, page 15, October 26, 1954. [---] Article in an unknown newspaper, USA, November 2, 1954. [jg1] "Black-out Sur Les Soucoupes Volantes", book by Jimmy Guieu, Fleuve Noir publisher, France, 1956. [mc1] "Les Apparitions De Martiens", book by Michel Carrouges, (aka Louis Couturier), Fayard publisher, France, pages 80,81,103, 1963. [jv7] "A descriptive study of the entities associated with type 1 sightings", article by Jacques Vallée, in the ufology magazine lying Saucer Review (FSR), U-K., Volume 10, #1, pages 8,22, January / February 1964. [jv1] "Un Siècle d'Atterrissages", article by Jacques Vallée, in the ufology magazine Lumières Dans La Nuit, France, #43. [jv1] "Passport To Magonia - On Ufos, Folklore, and Parallel Worlds", book by Jacques Vallée, Henri Regnery publisher, USA, page 147, 1969. [ge1] "Liste des cas d'observation d'occupants", in the ufology magazine Phénomènes Satiaux, GEPA, France, #29, page 19, 3rd quarter 1971. [jv2] "Passport To Magonia - On Ufos, Folklore, and Parallel Worlds", book by Jacques Vallée, Henri Regnery publisher, USA, page 147, 1969. [jg1] "Black-out Sur Les Soucoupes Volantes", book by Jimmy Guieu, Omnium Littéraire publisher, France, pp 222-223, 1956. [hd1] "Premières Enquêtes Sur Les Humanoïdes Extraterrestres", book by Henri Durrant, "Les énigmes de l'Univers" collection, Robert Laffont publisher, France, pp 53-54, 1977. [bb1] "La Grande Peur Martienne", book by Gérard Barthel and Jacques Brucker, Les Nouvelles Editions Rationalistes publishers, France, page 85, 1979. [fr1] "OVNI, Premier Dossier Complet Des Rencontres Rapprochées En France", book by Michel Figuet and Jean Louis Ruchon, Alain Lefeuvre publisher, France, pp 156-157, 1979. [lg1] "The Fifth Horseman of the Apocalypse - UFOs: A History - 1954 November - December", monography by Loren Gross, USA, page 6, 1991. [lg2] "The Fifth Horseman of the Apocalypse - UFOs: A History - 1954 October", monography by Loren E. Gross, USA, pp 41-42, 1991. [bh1] "UFOs and Alien Contacts - Two Centuries of Mystery", livre par Robert E. Bartholomew and George S. Howard, Prometheus Books publishers, New York, USA, page 300, 1998. [gz1] "RR3 - Le Dossier des Rencontres du Troisième Type en France", book by Julien Gonzalez, Le Temps Présent publishers, France, page 124, 2014. 0.1 Patrick Gross April 13, 2003 First published. 1.1 Patrick Gross December 29, 2009 Addition [ud2]. 1.2 Patrick Gross March 23, 2010 Additions [vm1], [lc1]. 1.3 Patrick Gross May 30, 2010 Addition [la1]. 1.4 Patrick Gross June 29, 2010 Addition [jv5]. 1.5 Patrick Gross August 14, 2013 Addition [pr1]. 1.4 Patrick Gross September 26, 2014 Additions [ad1], [ta1]. 1.5 Patrick Gross October 10, 2014 Additions [ra1], [ge1], [ni1], [ap1], Summary. 1.6 Patrick Gross November 21, 2016 Additions [er1], [ub1]. 1.7 Patrick Gross November 25, 2016 Addition [lg1]. 1.8 Patrick Gross December 21. 2016 Addition [lg2]. 1.9 Patrick Gross January 12, 2017 Addition [gb1]. 2.0 Patrick Gross February 7, 2017 Additions [jv7], [gz1]. 2.1 Patrick Gross September 18, 2017 Additions [sp1].